Search giant Google Inc. is keen on expanding the market reach of Android Wear, and soon you’ll probably see the operating system for wearable working on an iPhone model. That is at least according to some reports that indicate Google is testing Android Wear to function on Apple’s product, in addition to a wide array of Android devices. The experimental phase for an iPhone-friendly version of Android Wear is inching closer to its final stage, which means it will only be a matter of months before we see iPhone users toting an Android-based smart watch. The report comes as Google prepares for the upcoming I/O developers conference in May, during which the modified Android Wear OS is expected to be launched. At present, the Android Wear app works to display notifications on iPhones about new messages and features Google Now, among other Android Wear functions, according to sources familiar with Google’s development work. In preparation for the prospective tie-up between Android Wear and iOS (Apple, too, has Apple Watch, a major competitor to Android Wear), Google will develop support features for iOS software and WiFi, all of which will be slapped into the next iteration of Android Wear. But before making prospects of how Android Wear will integrate with the iOS ecosystem, Apple’s reaction to Google’s plan should be taken into consideration to begin with. If anything is sure, it is that Apple could put the plan on halt. Being an exclusive environment, Apple would have to approve Android apps before they see their way through the App Store. That could bring quite a major blow to Google’s effort at expanding the user base for its apps. Otherwise, iPhone users will have a broader set of choices for apps that would likewise be able to use if they switch to Android phones, breaking free from Apple’s monopoly. The plan of introducing Android Wear to iPhones is a major leap from why Google launched the wearable OS last year. The goal was to grow the universe of wearable devices for users by adapting Android Wear to various models of smart watches. 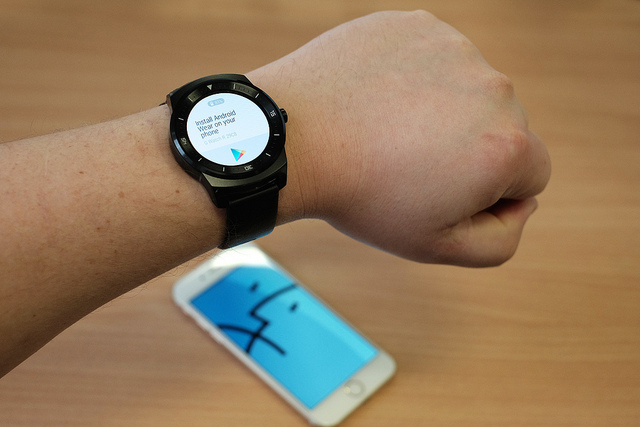 It can be made possible with the addition of developer tools that followed the Android Wear launch. Then late last year, Google added new features to the Android Wear app, as well as a fresh application programming interface to enable developers to build electronic watch faces for Android Wear gadgets. As the playing field for smart watches continue to expand, we’ll see over the coming months some other unlikely tie ups. But the main question here is after coming to the iOS market, how much android wear will be successful? As, Apple iWatch has already designed with lots of advanced features & functionalities. I think Android Wear will definitely have an uphill battle in the market, and particularly with iOS users, however I’m still excited to see more competitors come into the space. It definitely will have a positive effect on the overall category IMO. Also, I’m wondering if Android Wear might find a small niche among those who are invested in the Apple Eco System, yet wouldn’t mind adopting devices that play nice in that ecosystem. I, for one, find myself feeling too tied to Apple sometimes. Course that doesn’t stop me from buying the latest iPhone, iPad,etc. Regardless, will be interesting to see how Android Wear is received.